I also published a copy of this post in German. I love listening to audio books, both in my native language, and In German. I listen to them when I’m running, when I’m cooking dinner, when I want to curl up on the sofa and relax, and when I want to take my mind off work! When I used to commute to London every day, I had 1.5 hours of time, which I often used for listening to books or podcasts – I just needed to be careful not to listen to anything really sad whilst on the train, or anything that got me so involved in the story that I missed my stop – yes it did happen once! I had to wait half an hour in the freezing cold for the next train to take me back to where I needed to be! Anyway, in terms of learning English, people often go straight for the visual media such as films or tv series, and they forget about audio books. Here are some reasons why it’s good to include audio books in your learning programme, and how they can help you to improve your listening skills. Rather than studying lists of words that you may not know how to use in your own sentences, when you read, you automatically come across new words in context. The more you read, the more new words you’ll discover. You can then use this knowledge when you’re speaking and writing, so improving your vocabulary is a skill that benefits all areas of your learning. Listening to and reading sentences that have been structured well is a good way to train your brain to spot when things are wrong in your own sentences. You may not know exactly what the problem is, but you will begin to notice patterns in word order, and this will often alert you to look at parts of your own sentences again because something just doesn’t look or sound right. Often when people want to improve their listening skills, they go to Youtube, or they watch a tv series or movie, often with subtitles. This is good for exposure to the language, and it can definitely help with your vocabulary, but there are no subtitles in real life, and you don’t have any visual clues when you’re on the telephone. If you’re likely to be talking to people on the telephone, it’s really important that you build some activities into your learning plan that rely only on your ears. Podcasts and audio books tick this box. If you’re watching a film, sometimes the characters speak at the same time, or it’s hard to understand them because of background noise or a fast-paced conversation. Good audio book narrators will put expression into the characters’ dialogues, and they may use different voices for the different characters, but generally audio book narrators are chosen for their ability to read clearly and at a speed that is easy to understand (most book player apps give you the chance to speed things up if you want to). This means that you can listen to clear, spoken English with no background noise, which often makes it easier to understand. You don’t have to remember to put it in your bag – if the book is on your phone, the chances are that you will always have it with you. It doesn’t weigh anything and you can get it out if you find that you have a spare half hour. You can even have multiple books on the go if you can’t decide which one you want to read, and it doesn’t take up any more room – apart from the memory on your phone. Also, sometimes it’s hard to find time to fit in language practice, but if you’re listening to something, you can be doing other activities as well, so it’s a way to fit in an extra activity without taking up any more time. Audio books aren’t just stories. If you want to develop your business vocabulary in a specific area, look for a non-fiction business book on that topic. 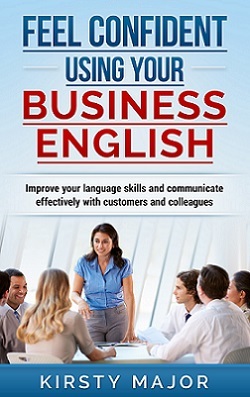 If you have a list of business books that you would like to read, try reading one of them in English instead. Alternatively, you could subscribe to an audio magazine or podcast that delivers timely news and information about one of your areas of interest. If you didn’t quite catch what the narrator said, you can easily skip back a few seconds. If you want to make sure that you really understood something, you can listen to a chapter a second time. This isn’t possible when listening to other types of audio media such as live radio. Have you ever seen a word written down, known what it means, but had no idea how to pronounce it? If you want to work on your pronunciation and learn how to pronounce new words, audio books are a great way to do this – just be clear about what kind of English you want to speak, and be sure that the speaker also speaks that kind of English (British English, Australian English, American English etc). It may not be fun at the beginning if you really don’t enjoy reading or you find listening difficult, but if you can’t wait to find out what happens in the story, or you are really interested in what’s being discussed, you will be motivated to keep listening. There have been nights when I’ve stayed up way too late because of the book that I was reading – I wanted to find out what happened next. Ok, I was doing all of the above things – improving my German vocabulary and listening to how the words were pronounced, but I was invested in the book and motivated to keep listening. If you can get to this stage, you won’t feel like you’re doing language learning activities, but following your favourite characters to find out where their journey leads them! Indeed, that’s another really useful resource.